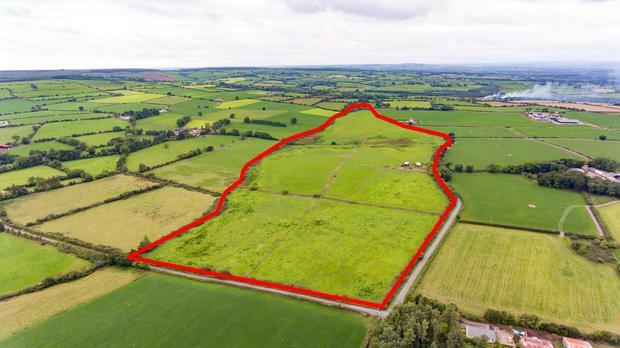 A recent East Cork auction saw an agent representing an adjoining dairy farmer enter the race late in the day and buy a 70ac farm for €655,000. The holding with extensive road frontage at Garrycaheragh, Ballynoe included a dated yard and land that needs attention. Located 3km from Ballynoe village, the property is 20km from Fermoy and 22km from Midleton. According to auctioneer Mick Barry of Fermoy the land is all good quality, sound and level with road frontage "that must be half a mile long". The farm is bounded on one side by the road and runs down to a stream at its lower end. All in grass, the ground is in need of investment involving the repair of an existing drainage system between the road and the stream. The fields are in need of reseeding. The yard consists of two cubicle houses in poor shape, where the roof is missing from one. Along with a cattle crush and silage slab, other services include a private water supply and electricity. The holding has an annual EU single farm payment of €2,094. At auction Mr Barry opened proceedings when he accepted a bid of €450,000, clearing the way for two bidders to engage, one from Midleton and the other all the way from Dingle in Co Kerry. In bids of €10,000 the pair drove the price quickly to €600,000, at which point the auctioneer consulted with the representatives of the vendor and it was agreed to open a sealed valuation. The amount on offer in the auction room obviously exceeded the sealed valuation and the property was put on the market. At the resumption a new bidder, agricultural consultant Mike Brady acting for a local farmer, joined the fray, while the Dingle bidder withdrew. In bids of €5,000 the consultant and the Midleton man stayed the course until the latter brought the price to €650,000. Mr Brady hesitated before adding €5,000 to the price and the hammer came down in favour of his client at €655,000. Mike Brady described the sale as a lively, genuine auction. "I suppose my client paid more than he had expected but it is in his natural grazing block so he was anxious to buy it," he said. Mr Barry was delighted with the result. "I must say it exceeded my expectations. The place has tremendous potential, one has only to look at the farms around it to see how productive they are, but it needs money spent on drainage and reseeding, it could take anything up to €2,000/ac to bring it right, so €9,300/ac is a great price," he said.